Recital time! 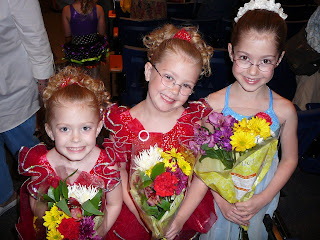 The girls worked so hard throughout the year and the big pay off was their ballet recital. They all did such a wonderful job. Grandma and Crappa got the girls each a beautiful bouquet of flowers. A funny side note- Sarah could not say the word "recital" instead she would say "recycle". It was so hard not to laugh when she would ask people if they would like to come to her recycle! Sarah looks like Janece in this pic!!! Such cuties. Oh, my! they are so beautiful!!! !